Why host a kids' craft party? Stencil invitations: Cut out your own stencil or buy one from a craft store. Fold a piece of paper in half and stencil the design on the front. Write the information for your crafts party inside. Keep the design simple. Be creative and check out a scrapbook store for invitations that your child can make to indicate it will be a craft party! Set up a room for kids to do arts and crafts (cover the floor with plastic or newspapers) or, host the party outside. 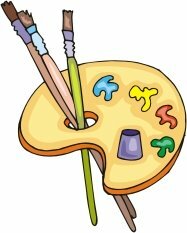 Provide easels, tables and white paper for creating artwork and crafts, along with lots of craft materials, such as markers, safety scissors, glue, fabric scraps, sequins, glitter, stickers, colored paper, and so on. Hang the birthday boy's or girl's arts and crafts projects around the party room at child's eye level. Decorate the party table with art and craft supplies. Make placemats for the party guests that look like artists' palettes. Dough Designs: Give the kids Play-Doh or baker's clay (dough made with flour, salt and water) and have them shape the material any way they like. Tell the kids to keep their masterpeice a surprise till everyone is done, and then have the children guess what each dough object is supposed to be! Decorate T-shirts or pillowcases: Give each child a white T-shirt, or request on the party invitations that kids bring a white T-shirt that can be decorated. Cover an area of floor with thick cardboard from the sides of large boxes. Insert a thinner, smaller piece of cardboard inside each T-shirt to keep paint from running through to the back. Tape the shirt and thin cardboard down to the heavier cardboard, keeping the front surface flat. Have kids decorate their T-shirts with non-toxic fabric paints. Allow the T-shirts to dry and let guests wear the shirts home at the end of the birthday party. For girls... have them make diva gloves! Before the party, create a long banner. By either taping pieces of paper together, or looking for connected printer paper at a office supply store. Create a design or lettering across it. Set out markers or crayons and have them do the decorating for the party themselves! Have the kids create their own puppets. They can even put on their own puppet show! Frost the cake with white frosting. Decorate the top of the birthday cake to look like an artist's palette, using colored frosting to make circles of "paint." Set a clean, new paintbrush on top of the cake. Bake or buy large cookies, (or even a large cookie cake) and let party guests decorate them any way they want, using tubes of icing, gels and sprinkles. Let the kids keep their decorated T-shirts. Make extra baker's clay and give each guest a portion to take home at the end of the birthday party. 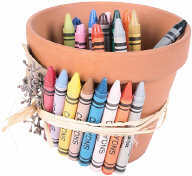 Invite an arts-and-crafts teacher to the craft party to lead the kids in some creative activities. Some scrapbooking stores that have classes can hold a party in their store and show kids some great crafting ideas! There are a variety of craft ideas and other great craft party activities for kids, right at your fingertips!